WASHINGTON — Yes, President Trump's purge/upheaval at the Department of Homeland Security is another example of the chaos inside the administration. And, yes, it's a reflection of its immigration failures, as we said yesterday. But it's also simpler than that: It appears Trump is throwing a tantrum — when it comes to his border policies and his former chief of staff, John Kelly. Regarding the policies: "President Donald Trump has for months urged his administration to reinstate large-scale separation of migrant families crossing the border, according to three U.S. officials with knowledge of meetings at the White House," NBC's Julia Ainsley and Geoff Bennett reported. "Trump's outgoing Homeland Security secretary, Kirstjen Nielsen, resisted — setting her at odds with the president." 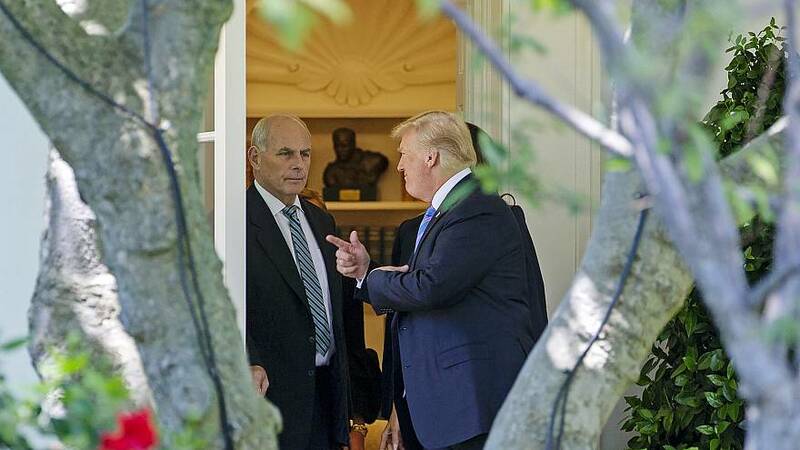 "[Secret Service Director Randolph "Tex" Alles] was pushed by John Kelly," Staropoli said, per the Post. "The president likes generals. But now it looks like he's cleaning house." Today's election represents more than Benjamin Netanyahu trying to become Israel's longest-serving prime minister - and certainly more than President Trump trying to get his preferred choice (Netanyahu) to win. At stake is arguably the future of the West Bank - after Netanyahu promised to extend sovereignty to parts of it if he's re-elected. "Do voters want to make permanent their country's control over the West Bank and its 2.6 million Palestinian inhabitants? Or do they want to keep alive the possibility that a Palestinian state could be carved out there one day?" the New York Times asked. The Washington Post adds that voting sites in Israel opened today "with final opinion polls giving an edge to the party led by Netanyahu's main rival, former military chief Benny Gantz." "While the polls suggest that Gantz's party will win the most seats in parliament, Netanyahu still seems to be in a stronger position to assemble a governing coalition, which is what ultimately matters." Trump recognized Israel's annexation of the Golan Heights. And the president designated Iran's Revolutionary Guard as a terrorist group. Our question: If Gantz wins, what will Trump's relationship with him look like after this? 2020 presidential candidate Amy Klobuchar announced yesterday that she raised more than $5.2 million for the first fundraising quarter (Jan. 1 thru March 31). Rep. Eric Swalwell, D-Calif., became the latest Democrat on Monday to announce he's running for president in what's already a crowded field, NBC's Alex Seitz-Wald writes. "I see a country in quicksand, unable to solve problems and threats from abroad, unable to make life better for people here at home. Nothing gets done," he told comedian Stephen Colbert on his late-night show. "I'm ready to solve these problems -- I'm running for president of the United States." "Swalwell has also made gun control a focus of his career and is due to hold a town hall Tuesday in Parkland, Florida, the site of the 2018 mass shooting at Marjory Stoneman Douglas High School." On the campaign trail today: Kirsten Gillibrand participates in a town hall on CNN… Eric Swalwell holds a town hall on gun violence in Florida… And Howard Schultz is in Kansas. By the way, this isn't the first time Cruz has committed this kind of Twitter jinx. Here was his tweet before last year's Game 7 between the Houston Rockets and the Golden State Warriors. That's the share of Virginia registered voters who want Democratic Gov. Ralph Northam to stay in office after a blackface scandal rocked his administration, according to a new Wason Center poll. Despite the slight majority who stay that he should stay in office, Northam's approval rating has suffered as a result of the high-profile scandal, with his disapproval jumping from 24 percent to 49 percent since December. Don't miss the pod from yesterday, when we looked at how Americans feel about their taxes — and how much partisanship plays a role. Stephen Miller is the last man standing on Trump's immigration policy team. A federal judge has blocked Trump's policy of returning asylum seekers to Mexico while their requests are being adjudicated. Trump says America is "full." Much of the country actually has the opposite problem. The federal government isn't really going along with the White House's plan to challenge climate change science. So far, there aren't major signs of Biden's support in early states slipping too much. Here's how Bernie Sanders answered a question about open borders.